Shop the Save More Event and save up to $160 USD! 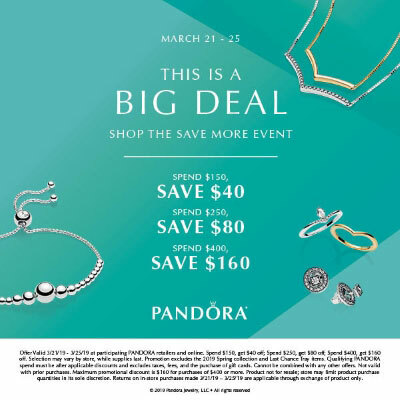 Starting Thursday 21st March until Monday 25th March, save up to $160 on PANDORA! The PANDORA Save More Event starts on Thursday 21st March through to Monday 25th March 2019. Spend $150 to receive $40 off, spend $250 to receive $80 off and spend $400 and receive a whooping $160 discount! The qualifying spend excludes the 2019 Spring collection and Last Chance Tray items. This promotion cannot be combined with any other offers and is not valid with prior purchases. The qualifying PANDORA spend must be after applicable discounts and excludes taxes, fees and the purchase of gift cards. I have been debating on which Reflexions bracelet to get. I nearly decided on the new Multi-Strand one but then I decided on the PANDORA Rose one. As I am a little worried about the Multi-Strands looking messy and I think the Rose colour looks pretty in the mesh finish and will hopefully suit my skin tone. I will definitely write an article about it so hopefully that will help you to make up your mind too. I wish they’d do this promo in the UK .